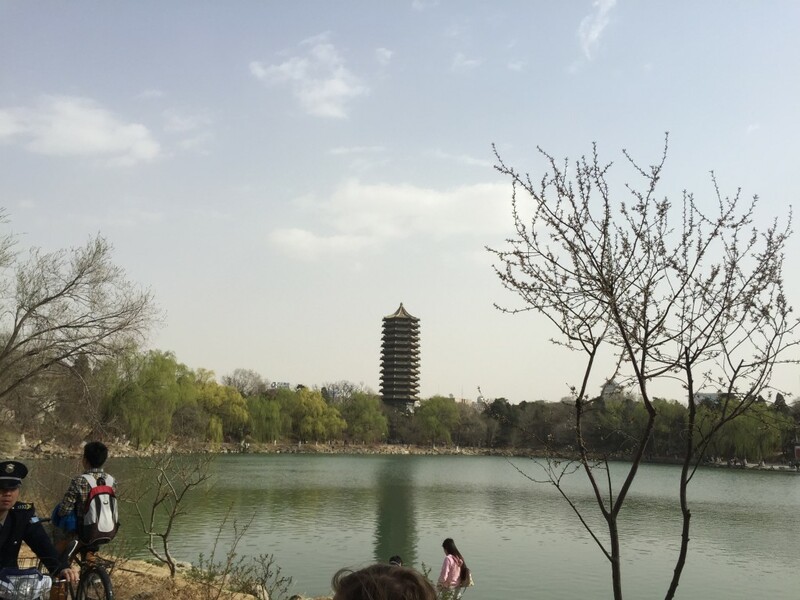 Across Weiming Lake, the Boya Pagoda at Peking University rises above the campus landscape. Built as a water tower in 1924, Boya Pagoda’s literal translation is “elegant knowledge.” Elegant is a word I hear from our translators often. It is a trait they admire. In English, elegant can be defined in two ways. The first is the traditional use of the word, pleasingly graceful and stylish in appearance or manner. Think Audrey Hepburn. The second applies to a scientific theory or the solution to a problem that is pleasingly ingenious and simple. This elegance is the reason why we are in Beijing. A U.S. delegation from North Carolina, consisting of four high school students, two organizers, and three invited guests, are here for the 35th Annual Beijing Youth Science Creation Competition (BYSCC) being held at Beijing Middle 101 in the Haidian District. The challenge focuses on creating projects and research that intend to answer societal problems, and the delegates are here to both compete and observe. can begin with a connection in this gym. At the BYSCC, nearly 2000 high school students from Beijing and more than a dozen countries showcase their research and inventions. The efforts of the student participants reflect relevant issues. Some focus on environmental issues, some on biomedicine, and others on efficiency in engineering. They dare to pose elegant solutions. A significant majority of the projects focus on environmental issues such as climate change and air pollution. Air pollution is a critical concern in China, as the country leads the world in coal consumption, fueled by its meteoric growth. Student research projects included devices for measuring air quality, a robot that purified air, and a window designed to separate the outside smog-filled air with clean indoor air. During our weeklong visit, we saw only hints of blue sky, mostly hidden behind a thick curtain of pollution. There’s a lavish award ceremony that features a traditional shadow puppet show, music, and dancing. In our group, Megan and Rachel take home a prize for excellence in innovation. Rachel and Peter receive second prize recognition for excellence. The following day Jenny takes home first place for excellence for her research. The celebration of student accomplishments is enviable at BYSCC. For the Chinese students in particular, there’s a lot on the line. Some of the awards come with acceptance into a university or college. Dignitaries from the Beijing Association of Science and Technology and other public officials attend the ceremonies. The audience is loud, cheering on their friends when they are escorted to the stage to receive their awards and pose for pictures from the small army of photographers attending the event. The event demonstrates that academic success can be celebrated at the same level at which we celebrate our athletes and celebrities. The final day we are treated to a visit to the Great Wall of China at Badaling. We are walking on one of the great wonders of the world, portions of which are more than 500 years old. It’s an engineering marvel that winds through the mountains that border northern China. It is not lost on me that the wall was meant to keep others out, a symbol of a great divide and isolation. But we are here through the connections of science and the ability to imagine a future that cuts across borders and walls to help solve the greatest concerns of humanity. Earlier in the week, we toured the Imperial Garden with its gnarled, ancient trees and natural stone sculptures of weathered white rock. The students, Jenny, Megan, Peter, and Rachel, snapped pictures of themselves at the Hall of Imperial Peace. Our three translators, college students at Beijing universities, took in the sights from nearby. The week was full of stories. Stories of individual students, told this week through science, the best of which demonstrate elegant solutions to overcome obstacles. To use science and technology to establish solutions based on a pragmatic need is a powerful tool and one that is celebrated at BYSSC. This celebration is not about a singular week, or project, or ceremony. This is an experience that will further fuel a passion for research and empathy to help others, and generate a lifetime journey of seeking elegant knowledge that creates global change. One Response to "Russ: Observations from Beijing"